Alcohol is the most widely used drug. Underage drinking is associated with academic challenges, health issues, negative social consequences, emergency room visits and roughly 4,300 tragic deaths per year. Luckily, there are effective ways to keep our kids safe. 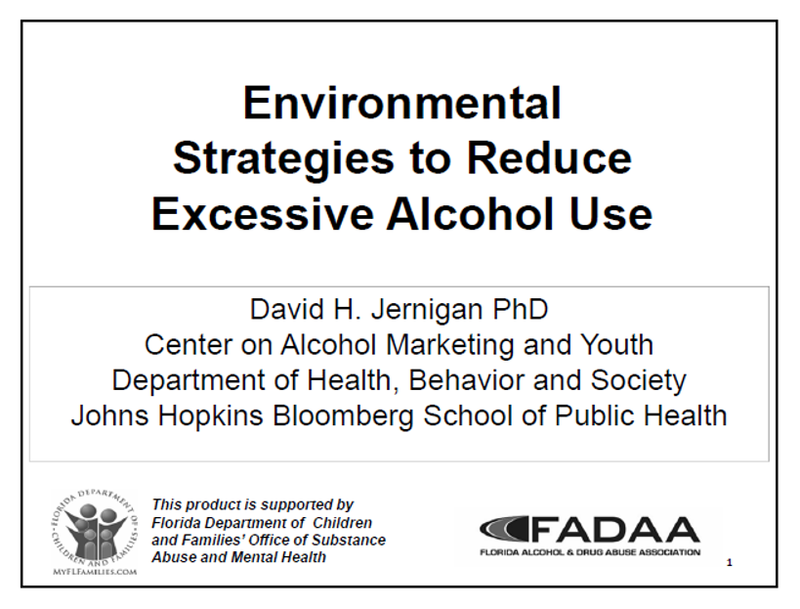 Learn about underage drinking in Florida and proven ways to prevent it from Dr. David Jernigan, director of the Center on Alcohol Marketing and Youth (CAMY) and Associate Professor in the Department of Health, Behavior and Society at the Johns Hopkins Bloomberg School of Public Health. Have you ever asked yourself, "Do I need this pill?" 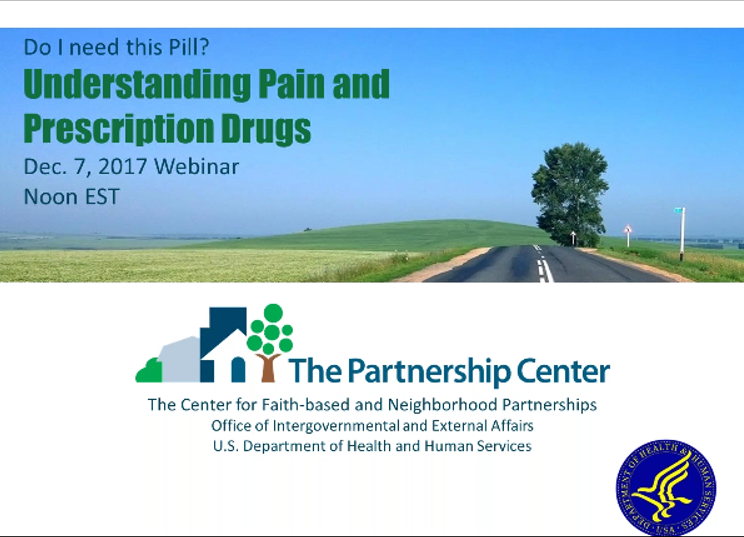 Substance Abuse & Mental Health Services Administration (SAMHSA) presents a webinar about how pain works, how opioids work for pain and why these drugs can be so addictive. 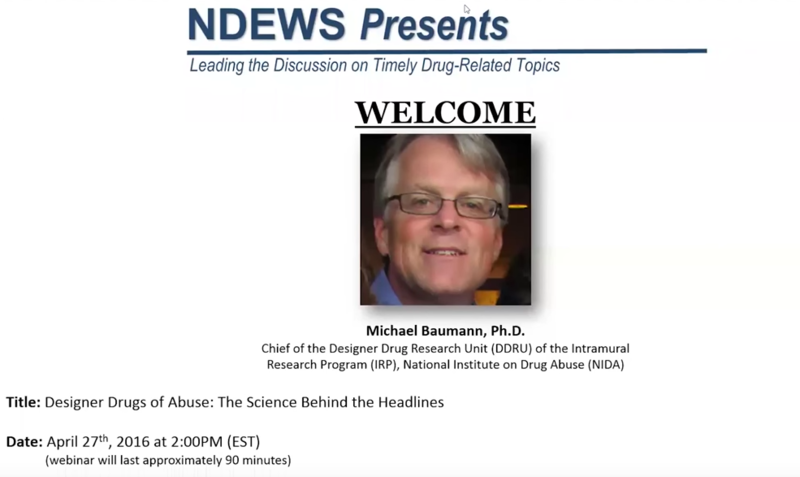 Get a better grasp of the nature of pain and learn about the newest and healthiest treatments for pain management from Dr. David Thomas of the National Institute on Drug Abuse. 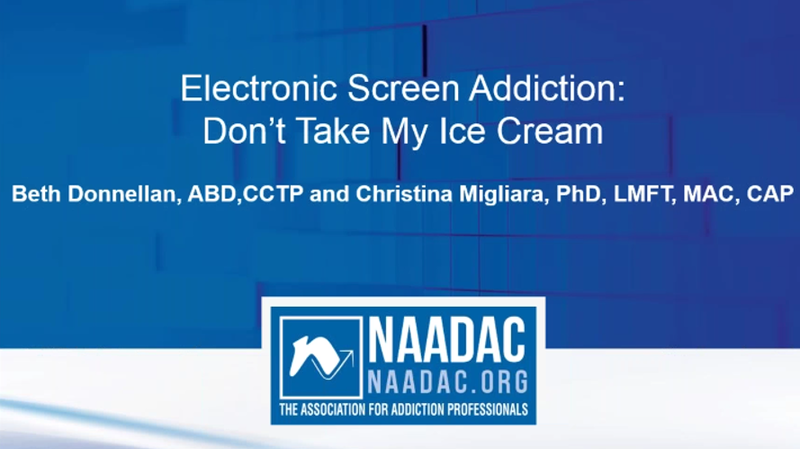 Recent studies show a connection between excessive use of electronic devices and substance addiction (with younger children at greater risk). 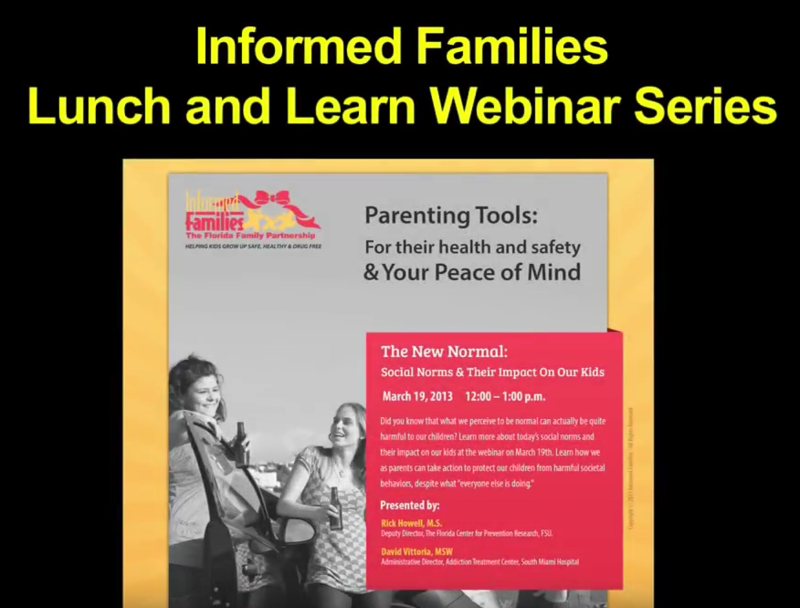 Hear from members of the National Association for Alcoholism and Drug Abuse Counselors (NAADAC) about how you can support children's healthy development and prevent issues with family relationships, impulse control and mental health/addiction in children and teens. 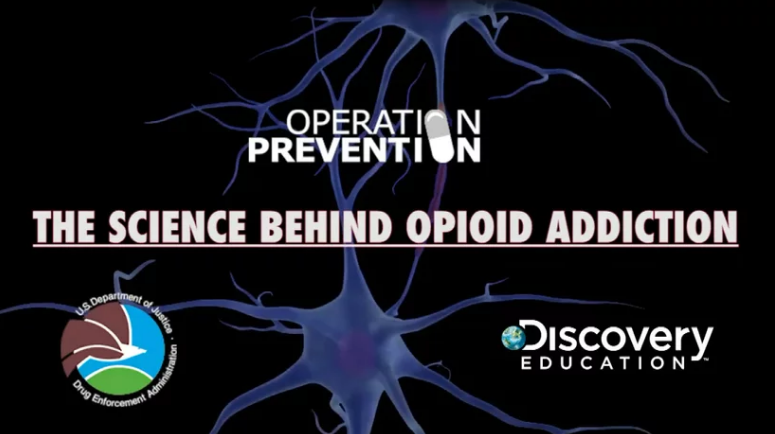 The Operation Prevention Virtual Field Trip explored the science of addiction to help middle and high school students understand how prescription drugs and heroin affect the brain and body. During this powerful forum, students got the unfiltered facts about drugs and addiction and had their questions answered by leading experts, including DEA agents and pharmacologists. 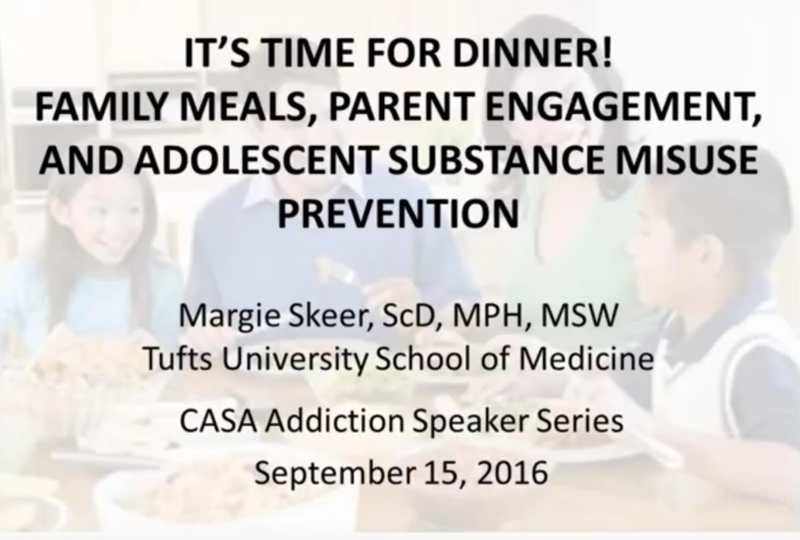 By Margie Skeer, ScD, MPH, MSW, Assistant Professor at the Tufts University School of Medicine in the Department of Public Health and Community Medicine, presented at The National Center on Addiction and Substance Abuse on September 15, 2016. 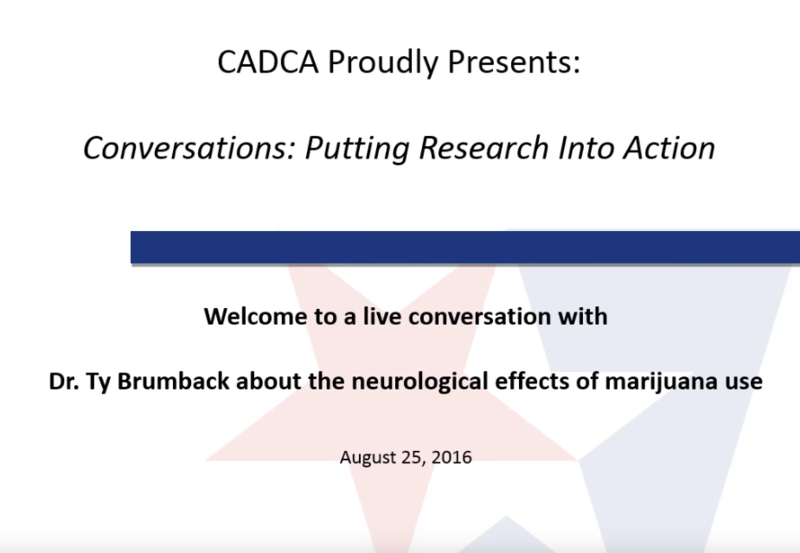 CADCA’s National Coalition Institute is pleased to announce the next edition in a series of a webinars entitled “Conversations: Putting Research into Action.” This is the next edition in the Research into Action webinar series in which CADCA hosts a live conversation with Dr. Ty Brumback from the University of California, San Diego. Dr. Brumback will be presenting his findings regarding the effects of marijuana use on brain structure and function. His work includes neuroimaging findings from a neurodevelopmental perspective. Flakka, opioids, heroin and synthetic marijuana are currently among the most widely abused drugs in Florida. How big is the problem? What are we doing to address it? 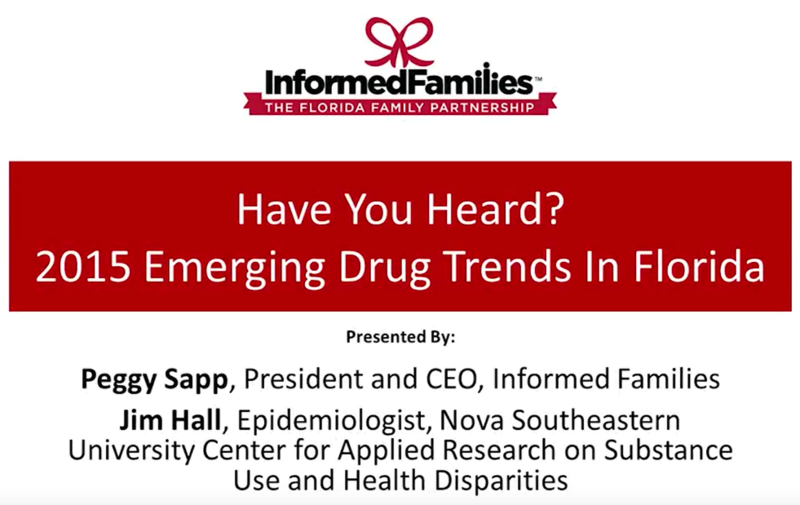 Join us for a webinar on June 10th from Noon to 1pm (ET) featuring renowned epidemiologist Jim Hall of the Nova Southeastern University Center for Applied Research on Substance Use & Health Disparities and Peggy Sapp from Informed Families. Learn about the latest trends and statistics, as well as what is currently being done to help solve the problem in Florida. Spring Break, Prom, Graduation...They’re BACK!!! Our kids are busy planning “all the fun they are going to have at PARTIES”...THINK RISKY BUSINESS. Are you planning to keep them safe? An average of twelve teenagers die daily, as a result of alcohol-related causes. Helen & John Witty’s family was dramatically changed forever when their daughter Helen Marie, at the age of sixteen, was hit and killed by teens driving a car after “partying” to celebrate Graduation. 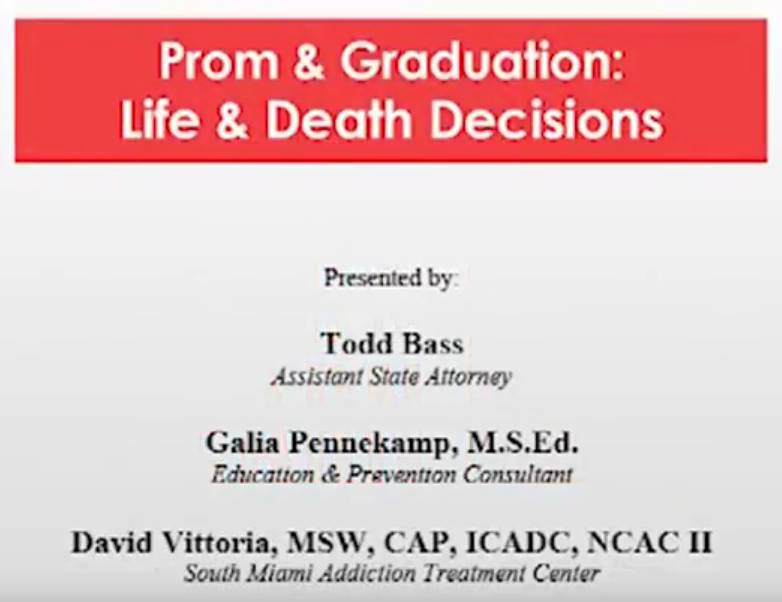 Join us in a candid conversation to learn about the Safe Homes Smart Parties® Campaign and what YOU can do to help prevent these deaths from occurring – and to learn about the consequences faced by the teens who caused the crash. If someone is creating a toxic environment for your kids, do you have the courage to speak up? Our children are growing up in an environment where unhealthy behaviors are perceived as normal. What do you do about it? 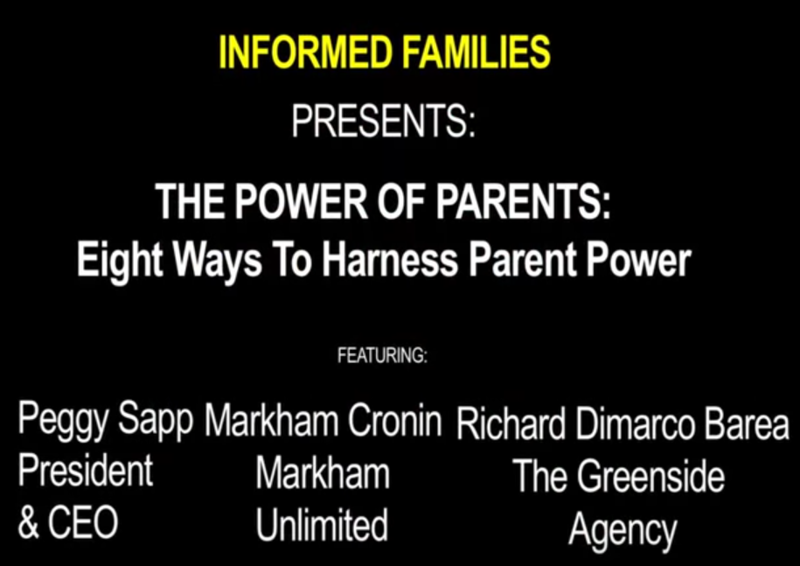 How can we, as parents, harness Parent Power to counteract unhealthy social norms in our children's lives? 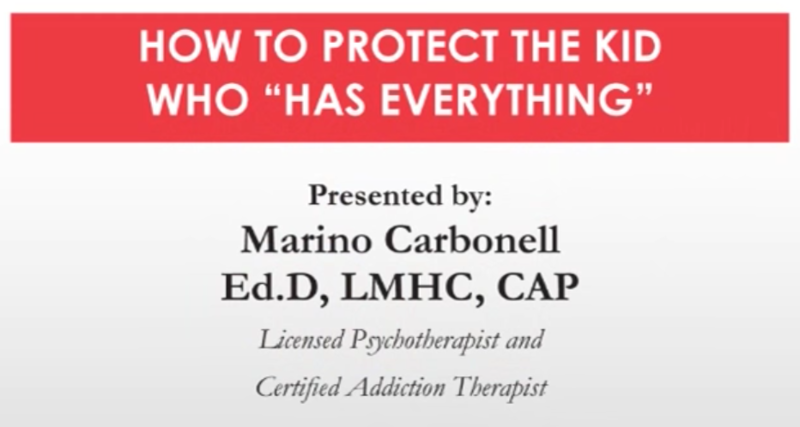 Learn more about today's social norms and their impact on our kids by watching this video, presented by Peggy B. Sapp, Markham Cronin and Richard Dimarco Barea. Find out how YOU as a parent can take action to protect YOUR children from harmful societal behaviors, despite what Your children think "everyone else is doing." Educate yourself about what most kids are really doing. 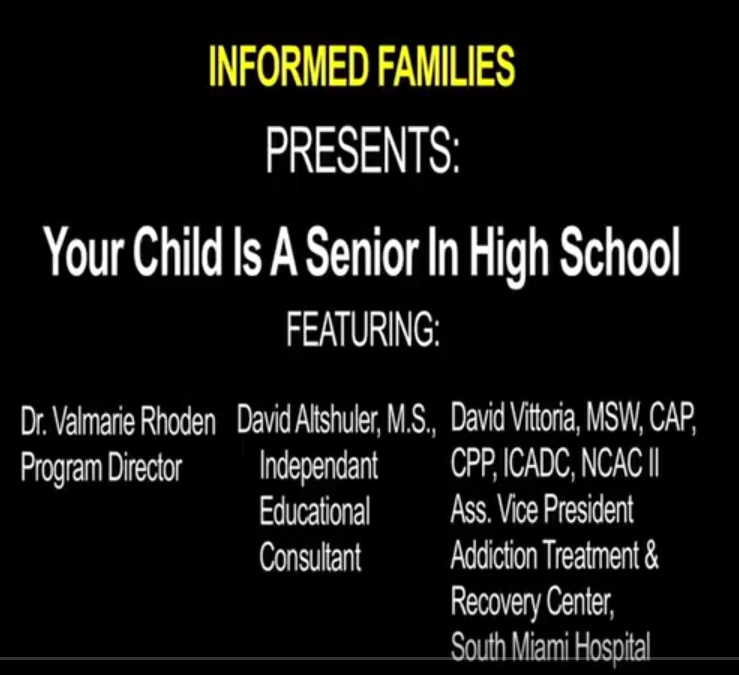 Highlights from Webinar: Your Child's A Senior In High School. Now What Do You Say? Your child is about to graduate from high school and will be off to college in the Fall. What can you do to help your child remain healthy and safe this year and the next four to come? What do they face? Learn how to communicate with and guide your teen to make good choices and stay out of trouble during senior year and in college. 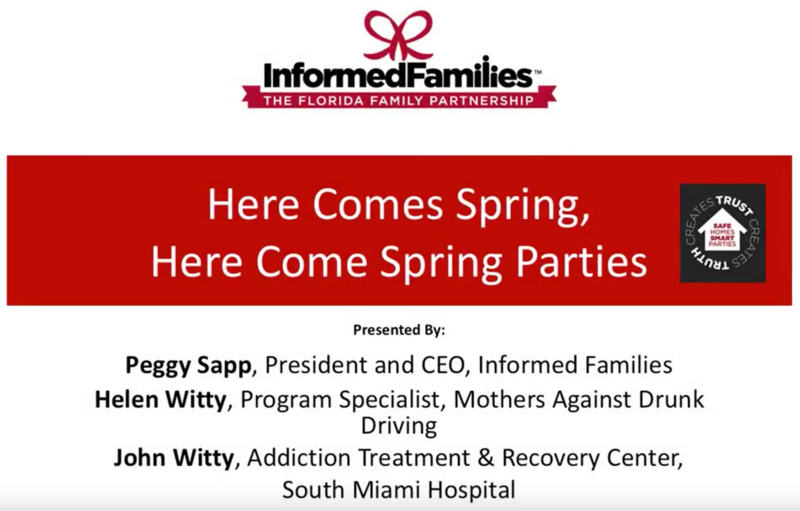 Learn simple and effective ways to help your child stay on the right track from an educational consultant and an addiction treatment professional. Every day, children are bombarded with millions of messages both positive and negative. One hour, one day or one week of prevention messaging is not enough to make a real impact and inspire healthy behavior. 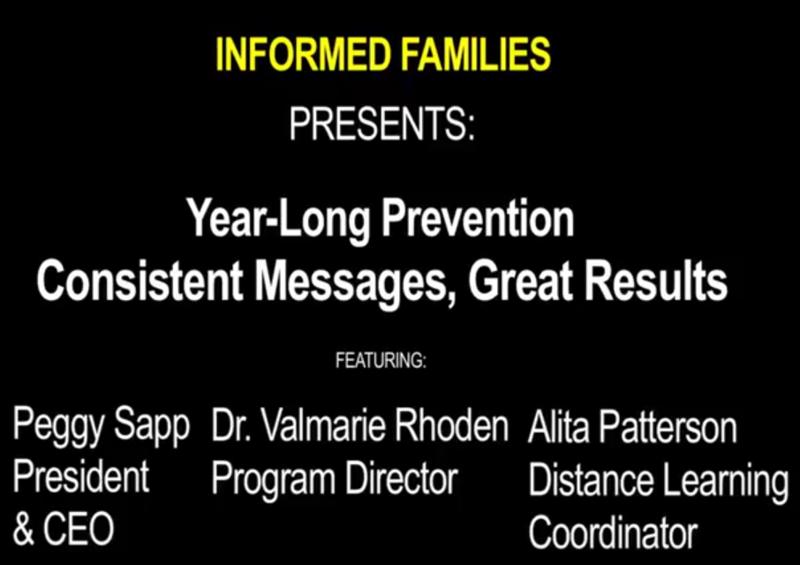 Learn how your children, school and community can benefit from Informed Families' year-round prevention messaging at our FREE webinar on January 9, 2014. 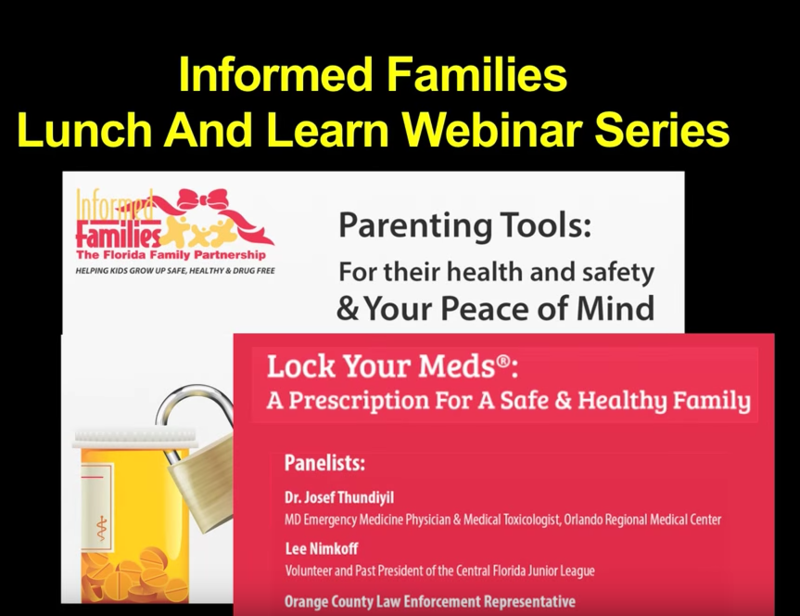 We'll introduce four universal campaigns for effective prevention, share success stories featuring an outstanding distance learning ambassador and unveil our newest toolkit for the Lock Your Meds® campaign to prevent prescription drug abuse. 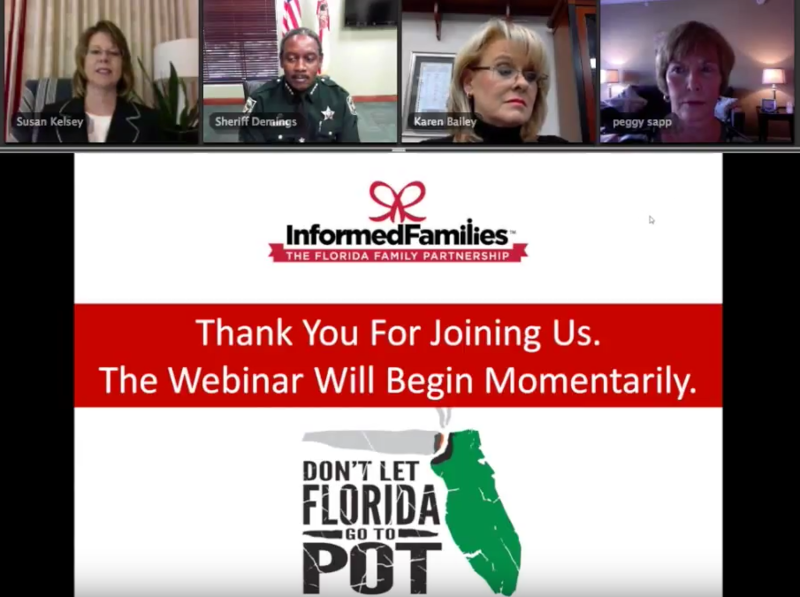 Join us and learn how save lives by building a safety net for children across the State of Florida and beyond. Are you sending messages your kids can hear? The research is simple: to keep our kids safe and healthy, they need support, skills, experiences and relationships that will help them develop into successful and contributing adults. But, how can we effectively communicate with our children? How do we know they are listening? Do you want to make a difference in the lives of children in your community? 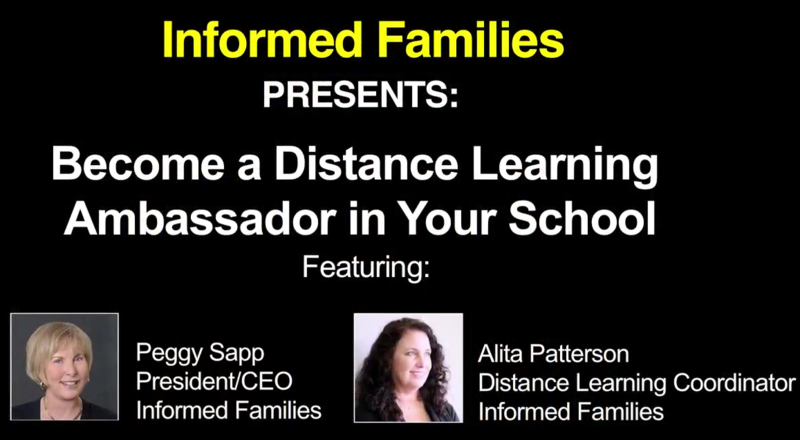 Learn how you can become a Distance Learning Ambassador and bring our year-round youth substance abuse prevention campaigns to your schools for FREE. 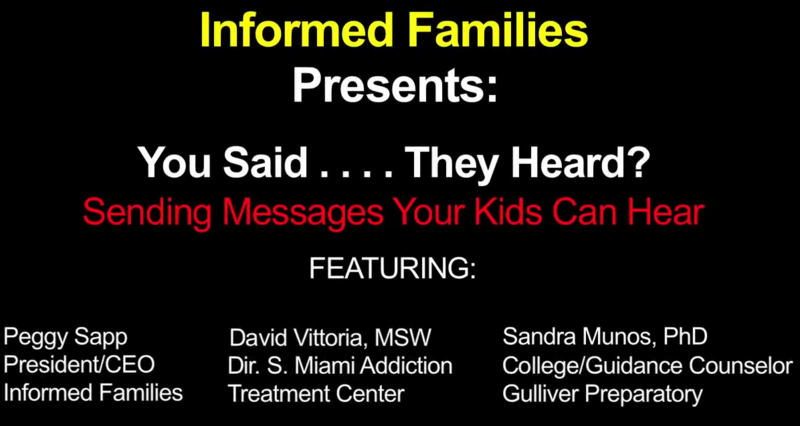 Watch Informed Families' March 2013 webinar on The New Normal: Social Norms & Their Impact On Kids, featuring President & CEO Peggy Sapp, Rick Howell of the Florida State University Center on Prevention Research and David Vittoria, Director of the South Miami Hospital Addiction Treatment Center. The video covers social norms campaigns in schools and how what we perceive to be the norm impacts our behavior. 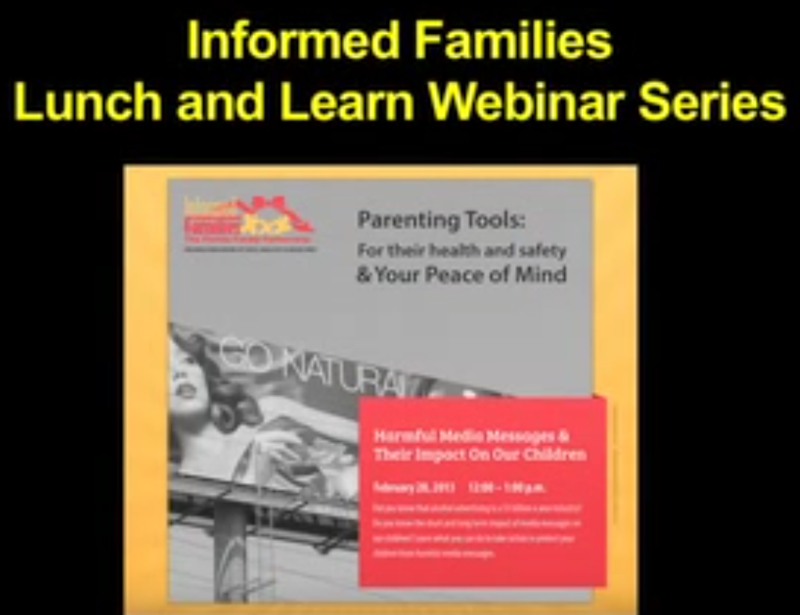 Watch Informed Families' February 2013 webinar on Harmful Media Messages & Their Impact On Children, featuring President & CEO Peggy Sapp, Director of Marketing Simone Knight and special guest Daniel Beldy, student at University of Miami's School of Communications. 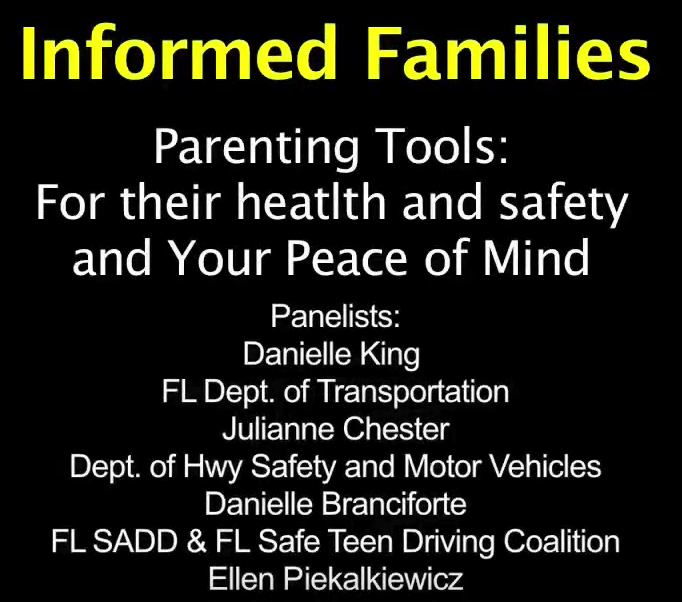 The panel will discuss the top 10 things parents need to know about media to keep their kids safe. 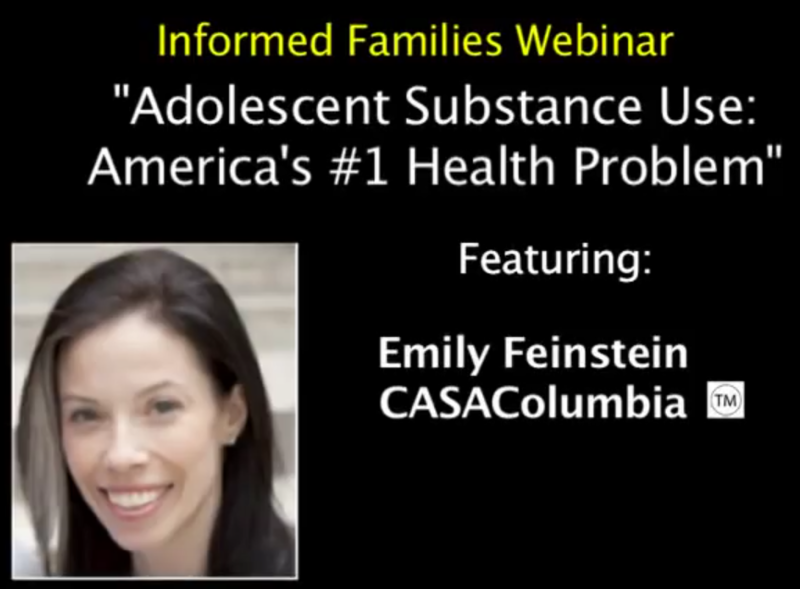 January 2013 webinar - Learn about the simple steps you can take to keep your children safe, healthy and drug free in an overmedicated world. 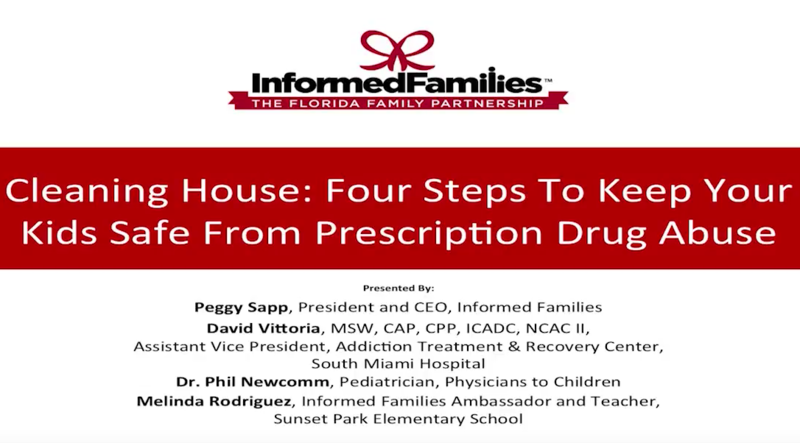 From securing your medicine cabinet, to taking inventory of your medications and properly disposing of old or unused medications, learn everything you need to protect your family and friends from prescription drug abuse. Learn everything you need to know about ways to keep your teen safe on the road. Find out about relevant driving laws in Florida and everything you need to know about obtaining a driver's license. What happens when your child is caught with a fake ID? Can you be fined or jailed for serving alcohol at a party held in your home? Miami Dade Circuit Judge Beth Bloom & and high school student (and son) Jacob Stern, Founders of the Listen UP program educate and empower parents to take action to prevent permanent consequences from their teen's mistakes. Learn simple ways to help your kids grow up safe, healthy and drug free on October 11th and find out how you can participate in the oldest and largest drug prevention program in the US, Red Ribbon Week™. Does your school celebrate Red Ribbon Week every year? 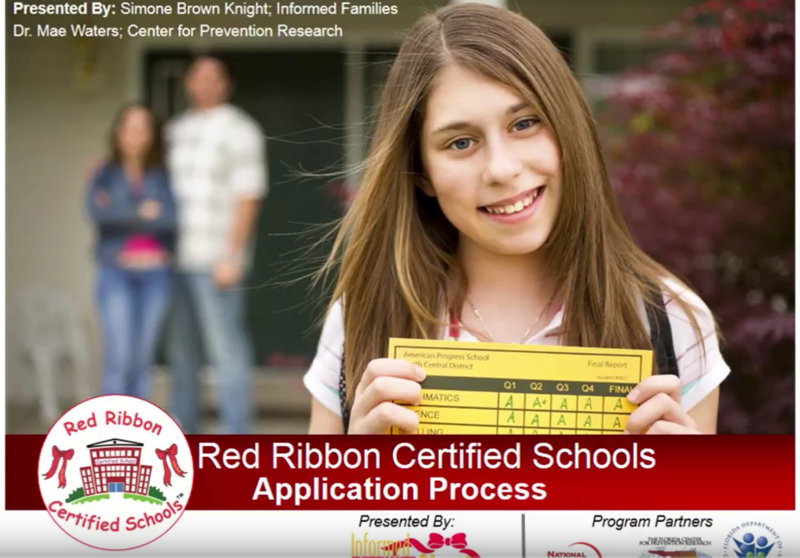 You should become a Red Ribbon Certified School to get national recognition for your school's efforts in promoting academic excellence through youth substance abuse prevention. 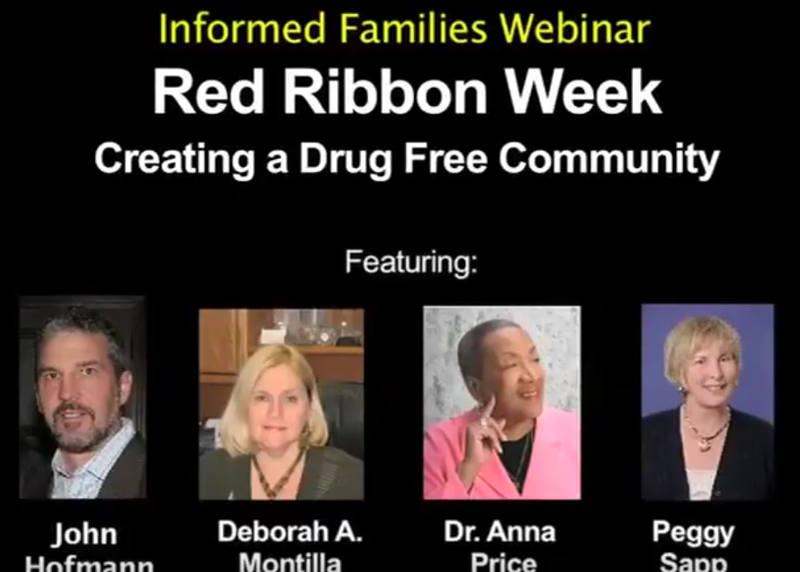 View this pre-recorded webinar or join us live from Sept. to Dec. Register at www.RedRibbonschools.org to attend a live webinar. Did you know that frequent Family Dinners has been scientifically proven to prevent teen drug use and other risky behaviors? Learn more about the science along with simple strategies for effective communication and how to develop rules to maximize your time together. 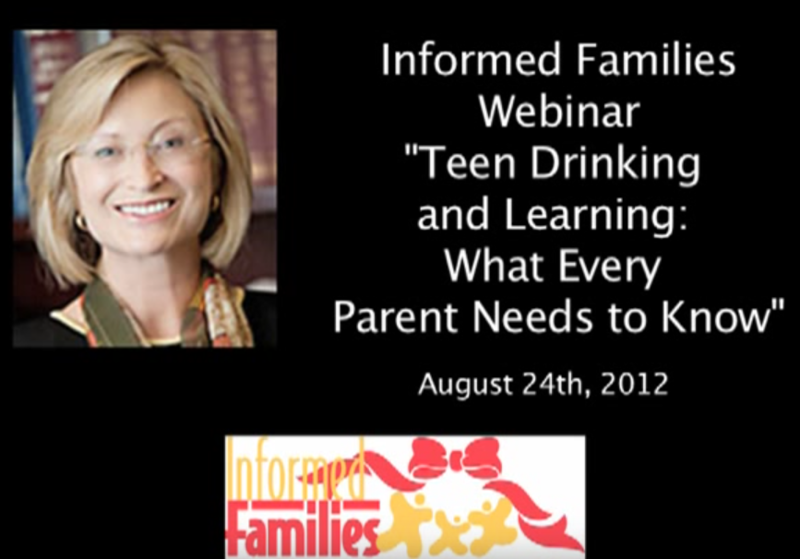 Learn how underage drinking can affect your teen's learning abilities and potential for success. Presented by Dr. Sandra A. Brown, Vice Chancellor for Research at the University of California -- San Diego. Lunch and Learn Event: Learn how to prevent tragic consequences for yourself and your teen during spring celebration season. Hear from our three panelists in education, psychology and law enforcement. Protecting The Kid Who "Has Everything" More money, more problems? 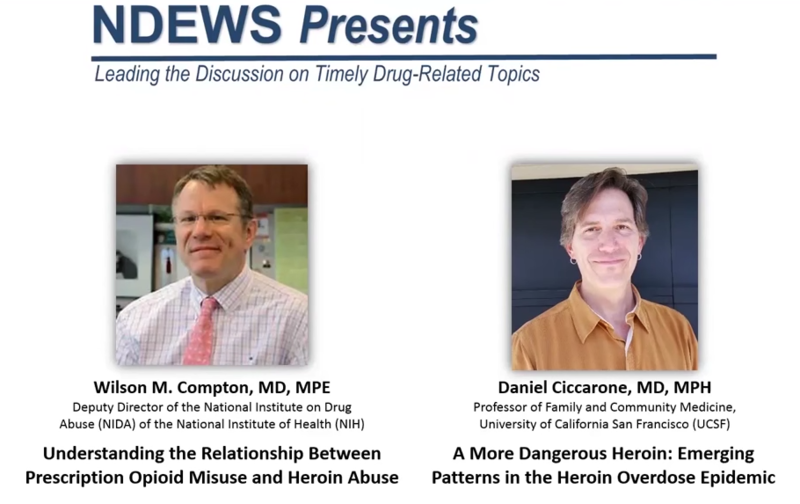 Today's Lunch and Learn event, presented by Dr. Marino Carbonell, focused on this very topic. 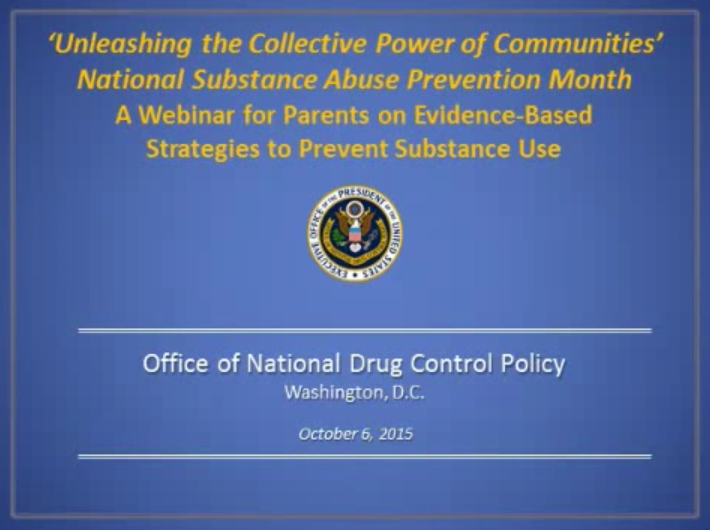 According to Dr. Carbonell, every school and every community has drugs. In poorer areas, the kids might be sniffing glue while the kids in more affluent areas are snorting cocaine. Here are 9 tips to help your kids grow up safe, healthy and drug free. 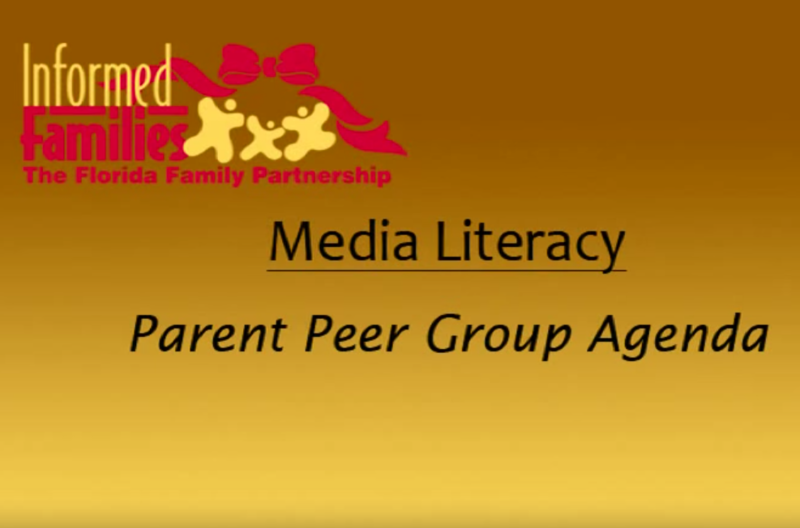 Parent Pilot Kit Media Literacy Agenda: Peter DeBenedittis, nationally renowned speaker on media literacy, shares insights on how television affects the decisions of children and adults. 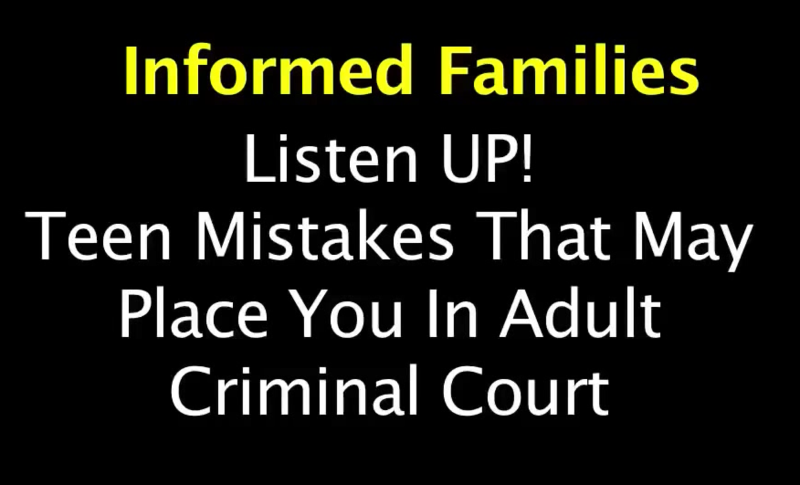 See what you can do to stop the insidious influence of the media on your family.